“Pope is bringing message of reconciliation and unity to Cuba”, Gerard O'Connell (La Stampa "The Vatican Insider" 3/25/12). Before Benedict XVI arrives in this Caribbean island, the Archbishop of Santiago de Cuba, says the Pope is bringing a message of reconciliation and unity for the whole country. Cardinal Ortega on What Cuba Is Expecting From Benedict XVI (Zenit, 3/26/12). “Benedict XVI will find himself in a Cuba geared to living a new period, both at the social as well as the religious level. A period of openings that must be consolidated,” said Cardinal Jaime Lucas Ortega y Alamino, archbishop of San Cristobal of Havana, in an interview with the Vatican newspaper L’Osservatore Romano leading up to the trip, which began today. As Cuba prepares to receive Pope Benedict XVI on March 26, an increasing number of voices both on the island and abroad are complaining that the local church authorities are ignoring dissident groups and showing favoritism to a government that oppresses its own people. They also fear that the pontiff's visit could be exploited for the same purposes. In recent days, Lech Walesa, the former leader of Poland's Solidarity movement that toppled the communist regime in 1989, as well as Cuban-American congresswoman Ileana Ros-Lehtinen, have joined Cuban dissident groups to ask the pope to speak out against human rights abuses by the island's communist government during his upcoming trip. The eyes and the prayers of parishioners in Havana's St. Rita of Cascia Church were focused on the 19 catechumens who will be baptized at Easter. Only the large group of reporters was fixated on the 35 women dressed all in white sitting near the front. 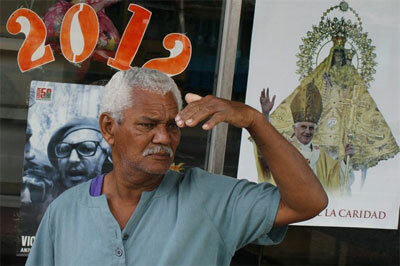 "We want just one minute with pope Benedict during his visit to Cuba", by Gerard O'Connell. La Stampa "Vatican Insider" 3/21/12) - The leader of the Women in White movement in Cuba, Berta Soler, speaks about the situation in her country today and what they hope for from Pope Benedict’s visit on March 26-28. Benedict faces an odd paradox in what is the first visit by a pope since John Paul II’s in 1998. The church’s profile as an institution has risen sharply in recent years amid a burst of religious tolerance not seen since the 1959 revolution, with church leaders advocating for political and economic freedoms, negotiating the release of dozens of political prisoners in 2010 and counseling the government on plans for re-engineering the economy. At the same time, the church has struggled to attract more worshipers and faces criticism that it has grown too cozy with Cuba’s tight circle of decision makers. “The church quietly challenges the regime so they are not seen as a great threat by it,” said Christopher Sabitini, senior director of policy at the Council of the Americas.